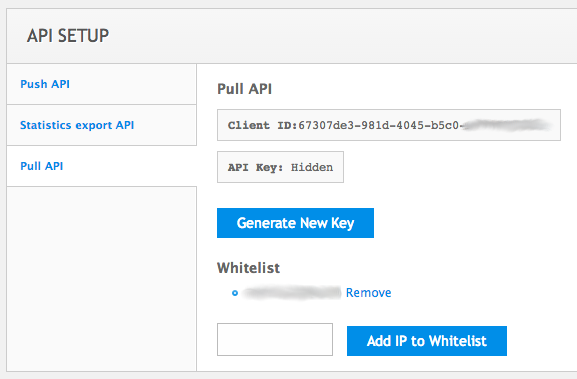 Another way for getting API ID and API key is to define them for separate users. This is useful when your client want to have direct access to his data. Read this article to learn more about it. Once you get user-specific ID and key the he may use them instead of account-wise client ID and API key. The data scope for this client ID and key will be limited to the client's data slices settings. All parameters mentioned below remain the same. Now you're ready to request the data. For streams stats you will need 3 API calls. Take data slices list for further operations. It will give IDs of slices for further re-use in other calls. Take streams list by the exact name or regexp. Request stream data which you see in stream daily stats. Each call is a GET request via HTTPS. You need to use HTTPS for all connections. As a response you get JSON structure with required data. If you have incorrect credentials for any request, the response code will be 403. You need to know your data slice ID in order to request stats for it. This ID does not change over time so you may obtain it just once and use it going forward. "name" : "Full data slice"
Each data slice is described with the name and its unique ID for further usage. "name" : "Total (5 streams)"
name - public name of the stream, as appears in WMSPanel streams report. stream - the ID which is received by previous streams list request; this ID can also be obtained in WMSPanel UI while looking at stream real-time stats. If some protocol does not have stats, it is not included in the response. If some day does not have stats, it is not included in the response. Q: I cannot run API call from command line. A: Please check this FAQ forum post. More APIs to come soon, so if you want to have more, just let us know about it.